Cade Foehner is a rock musician and singer who rose to fame after participating in the American reality shows, The Voice and American Idol. The fame brought him a lot of fans on social media and he has already advanced to the Top 5 on ABC’s revival season of American Idol. He vowed judges and audience with his stellar performance of “Black Magic Woman”, which earned him the likes of thousands of fans and still growing. Cade Foehner was born on the 24th of July 1996, in Shelby County, Texas, United States. He’s currently 22 years old. Place of Birth Shelby County, Texas, U.S.
Cade Foehner is the son of single mother, Kelly Menefee Foehner, who is a teacher at Center Elementary School. He has two older sisters, Blaine Goodwyn and Krystina Lout. Cade attended Panola College and later attended Liberty University in Texas. As of now, Cade hasn’t revealed anything much about his affairs or dating history on the show. He might have a mysterious girlfriend but nothing has been unfolded yet. There are also rumors that he has been dating his American Idol co-star Gabby Barrett but they haven’t yet confirmed so take it with a pinch of salt. He hasn’t appeared in any film to date. 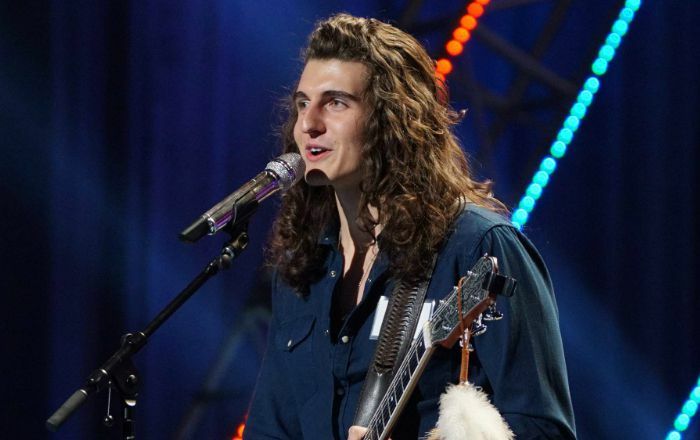 Cade Foehner first auditioned for the reality show, The Voice Season 11, but he failed to impress the judges. His first appearance on the television was with the singing reality show, American Idol in 2018. Cade made it to the top five before he was eliminated from the show. His appearance on ABC’s talent search show, American Idol in 2018. Cade was raised on a 100-acre farm in Shelbyville, Texas. He was a member of a jam band called Johnson’s Lost Crowes. He has been singing since he was in the 8th grade and also learned to play guitar on his own. He has been playing at local bars since he was a freshman in high school. Cade is a great fan of American Idol since he was at his teens and always desired to take part in the show, and now, he has advanced to the Top 5. His popularity on social media has seen an unprecedented growth ever since he was a contestant on American Idol. His Instagram alone has over 123 thousand followers. Cade has a Gibson J-45, a Marshall AVT150H, and an Epiphone Les Paul Standard. He’s one of the favorite spots in the American Idol 2018. Cade Foehner won the Texas 10 under 20 guitar competition at the Dallas International Guitar Festival in 2014 as well as made it to the finals of Louisiana Music Prize. His idols are Led Zeppelin, Jimi Hendrix and The Black Crowes. Cade Foehner enjoys playing Guitar, Bass, Drums, Banjo and Piano.